I just wanted to share a few layouts I have been working on recently. Normally I make “sample” pages that have just photo mattes and no pictures. But these are for a friend of a friend who is currently putting together books for her three adult children. So there was a lot to scrapbook. This layout is pretty simple. Nothing too fancy. The little girls on this layout are so precious looking! There were 8 photos to get on here, so we didn’t want to take away from any of them. 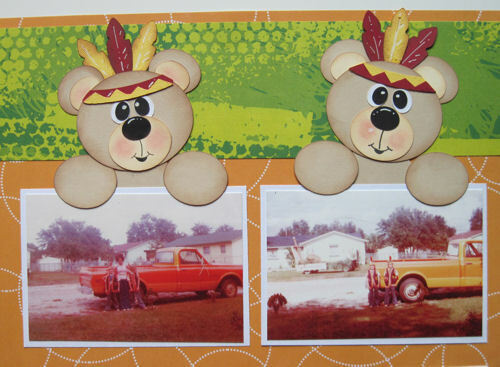 This layout showcased several photos of different special occasions. Because these boys are twins, I made two Indian Bears. If you don’t have the Gypsy, you can still cut out the letters from the Robotz Cartridge alone. The letters are approximately 2.25” high. The memories title block is one that I created. You can download the FREE jpg file below. You can also download the FREE Gypsy File for the “Childhood” Title. You will need a Gypsy and the Robotz Cartridge for it to work. I also used some buttons and some Cappuccino Twine from the The Twinery to make a “faux rope” to decorate the photo matte. Gypsy To Weld Them Together. I created the “Graduation” title block. I used some Twine from The Twinery to create the “tassel” on the grad cap. If you would like the title, you can download the Gypsy file below. These are files that will work with your Gypsy. They are the welded titles I created in the layouts above. You will need your Gypsy and the corresponding cartridges in order for these files to work. Click the add to cart button and check out. It will not cost anything to download during the free offer period. These files are in .JPG format. They can be resized, printed and hand cut or if your electronic die cut machine has the ability, you can print n’ cut. Okay, I hate to leave anyone out. So I decided to “whip up” a title so that those of you who have “other cutters” can utilize them. Please be sure to come back tomorrow as I will share some more projects and who knows.....maybe another freebie or two! I know awhile ago the links & such were all messed up and was told you were working on correcting matters. Just thought you may want to know that the indicator for 'Current Cricut Challenge' when clicked on gives an error so I had to keep clicking on 'Older Post' repeatedly to find the 6/6 Graduation challenge. Wow you are so amazing. You have been busy, busy, busy. Your layouts are too cute. Thanks for the freebies. Do not mena to be a pest but I clicked on the 'Currect Cricut Challenge' and still getting error: Sorry, the page you were looking for in this blog does not exist. Also, was not able to delete my comment and correct my typo 'mena' to be 'mean'. Thank you for sharing the svg file Grad. Great website!